Rising Strong™ is based on the simple physics of vulnerability: If we are brave enough, often enough, we will fall. 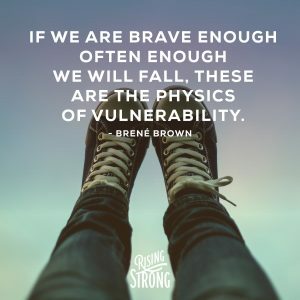 Based on the powerful book by Brené Brown, you will learn to get back up and how owning our stories of struggle gives us the power to write a daring new ending. In this 2-day intensive workshop, you will build a skill set to help you navigate courage, compassion, truth, grief and forgiveness. We’ll talk about setting healthy boundaries that hold you and others accountable. Rising Strong™ gives you a process to feel your way through the hurt that follows an emotional fall. Yes, please add me to the email newsletter.